The Brûlée Cart travels around Melbourne bringing crémé brûlée to the people. But not just the traditional kind...these guys have whipped up delicious flavour combinations to make you drool: Lavender & Honey, Dark chocolate & Peppermint, Cherry Ripe... I always feel like trying everything offered on the menu and it takes me a loooong time to come to a decision...but I've been lucky enough to visit The Brûlée Cart with friends and we usually try a few different brûlées between us. I've only ever caught the Brulee Cart at Federation Square (a convienent place for me as I'm around that way a lot). They're often there for The Flavour exchange, a quarterly wine-tasting/ food event held in The Atrium of Federation Sqaure. In our excitement, my friend and I tried both the combinations on offer which were French vanilla with strawberries and Ginger dark chocolate. French vanilla was lovely. It was rich, but not over-powering; sweet, but not sickening and it went well with the strawberries which were a bit tart. Next was the Ginger dark chocolate. I was surprised by this flavour- it was spicey in a gingerbready way; aromatic, pleasant and it gave the dark chocolate flavour a kick. I had expected this to be an 'acquired taste' for those prefered their desserts tasting different (i.e. bitter or hot) - but that wasn't the case at all! It was a chocolate concoction that reminded me of nutella, ginger biscuits and chocolate pudding combined into one. On another visit, my friend and I shared a Salted caramel and popcorn brûlée. It's been my favourite flavour so far...though I'm probably biased as I pretty much always opt for salted caramel when given a choice. The saltiness in the dessert was subtle, but it brought out a lovely sweetness in the custard. When topped with caramel-coated popcorn, what was not to love? Is it worth visiting? Of course it is! ooh how cute, a brulee cart! Hehe, it really is a pretty cute little thing! :) Have you tried a Brulee from here before? Interesting to know about this new trend in Melbourne.Very nicely written with lovely pics. 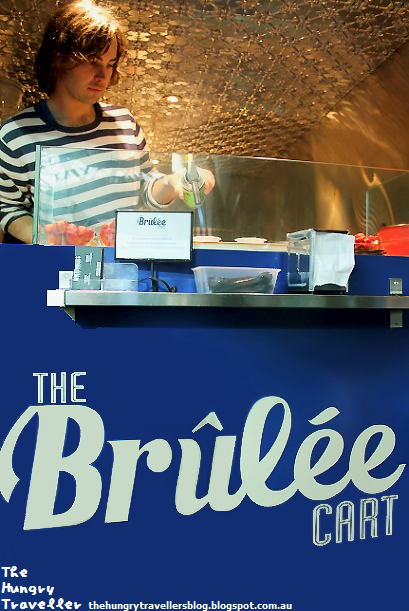 I think I might have seen the brulee cart at the Queen Vic Night Market the other week! Unfortunately I only had cravings for savoury food that evening so I missed out on trying some creme brulee - ah well, next time! Haha! I just mentioned the Ginger Dark Chocolate in response to your comment on my blog, and lo and behold - here it is! It sounds delicious, and you're making me crave it even more! Love, love, LOVE ginger :D Can't wait for the opportunity to try it myself! Oooh, and I like the addition of caramelised popcorn on the Salted Caramel! They didn't have that when I tried it back in August. Yum! Ah, ginger dark chocolate is pretty delish! Would really like to try their nutella and strawberry brulee...sounds amazing! And of course, the lavender and honey :) ...I really liked your picture of it. Looks so lovely with the flower petals! ...and then they keep making these new amazing flavours...too many to try!